A potential increase in herbicide-resistant weeds, particularly glyphosate-resistant weeds, is a major concern for the sustainability of Wisconsin crop production. Ross Recker and Dr. Vince Davis are once again conducting late-season weed surveys to proactively assess the potential for glyphosate-resistant weeds and/or changing weed problems in Wisconsin. 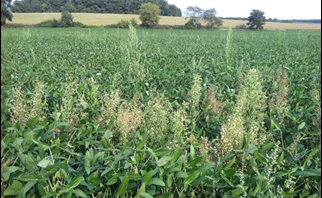 The survey is funded by the Wisconsin Corn Promotion Board, and in 2012 the survey led to the identification of at least one population of glyphosate-resistant horseweed in the state (https://ipcm.wisc.edu/blog/2013/06/a-horseweed-population-in-wisconsin-is-confirmed-resistant-to-glyphosate/).